Musings on garden and landscape design, gardening, urban planning, man, nature, human nature, and basically life as we know it. Some of the knowledge we lose living in urban and suburban areas is how plants naturally grow. As in, how BIG. As a result, we put big shrubs in the garden where little shrubs should go (I tend to make this mistake with Viburnum); and place trees too close to structures or crowd them together. 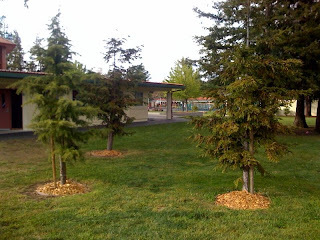 In this example at a Peninsula elementary school, two redwoods and one Atlas cedar have been triangulated about 8 - 12 feet on center. Now, this would make a nice grove of small ornamental trees such as cherry or crabapple. Or a compact windbreak of columnar specimens such as cottonwood or 'Fastigiata' hornbeam. But come on! These are long-lived forest giants, wanting to spread 50 feet or more. Even if they were to grow this close together in nature, they would probably be successive generations, never really competing with each other for light, water, nutrients and space. As this trio matures, they will create a maintenance headache for the Arborist who has to keep their limbs pruned clear of each other (with probably unattractive results). Even so, they probably will struggle along together, limp into midlife, and never achieve the cool grove I bet their planters intended. The lesson here: work with, not against, Mother Nature. She always wins. I make this mistake every year - but with perennial plants - easily moved around once I've realized my mistake. I seem to never learn. But trees? They's a bit hard to move one mature. Yes indeed! Unless you also own a tree moving company. Here's the story on one of the larger tree moves I've ever heard of; the arborist's update says the tree is fine, but I don't know that I'd go through all this to move a tree 45 feet. I am really surprised that a company would spend the $30,000 required to move a tree just off to the side, with the low probability of it's survival. As a plant/outdoors fan and wanting to see us humans create as little harm as feasible to the environment, I applaud them. As a PR move, I applaud them. If I were their business manager or accountant, I think they're nuts. Thank you, Buzz! My life will be complete when I get a client who insists on including your treasures in their landscape. ©2005-2015 John Black. All written and visual content on this blog is the copyrighted property of John Black unless otherwise noted. You may link to this site but its content may not be reproduced without my written permission. Thank you.